it is unfitting to touch the Sacred Covenants with dirty hands." isn't an American at all. We have room for but one flag, the American flag . . .
We have room for but one language here, and that is the English language . . .
compared with those who only know one language, Canadian scientists said. "You can be equal, but you must proceed under Joseph with his coat of many colors and under the prophet Samuel. You must go to their Promised Land. You must accept the Teaching and the Path and strive with these holy ones of God to perfect a Union long endowed. For sometime, somewhere the evolutions of other continents of Saint Germain have truly rejected him. And that karma is not removed from those nations, though it is removed from Saint Germain and the Lightbearers who have borne that world karma so long —especially the Messengers themselves. "Thus, the thoughtform for the year may appear complex, but then the organization, the Path, and even the awareness of the average chela has also become complex in a nuclear and space age—an age of computers and technology accelerating the capacity of the mind to know Truth in every area of learning." "So you begin to understand how the one mind of our beloved Francis Bacon influenced the course of Western civilization and laid the foundation for the New World, the new science, and the golden age. Realize that many who walked the earth in his life took on the very profile of his soul. Think of it, and think of the one who has in his heart the preknowledge of becoming the hierarch of the Aquarian age. "Think of your own destiny. Think how Saint Germain, therefore, did write down all of those molecules of word—coded, ciphered—demonstrating the interactions of light and darkness in the human scene and on the stage of the world. "Thus the lessons of the parables now become the plays of Shakespeare, which you ought to know far better than you do. Let lovers, therefore, of Shakespeare teach, demonstrate, act, and show the magnificence of the transmission of a teaching of the Christed One of the Aquarian age. "Realize that in the absence of Francis Bacon, this world would be several octaves lower in awareness, in enlightenment, and in illumination. This must tell you something about the genius of the mind that has its correlation in the genes of the body—and the genes, focal points of the seed of Christ.
" . . . Let us draw the lines! Let us be clear in our definitions! And let not words convey metaphysical ideas that have nothing to do with God-reality.
" . . . This is an age of the misuse of language—and of violation of the Word, if it were possible. And therefore, language, instead of cups of consciousness of the angels themselves, has become a device of manipulation and conditioning. There are words in this language whose original meaning has been so lost that I would no longer use those words to convey to you mighty truths, so colored are these and so charged with hostility and “instant” ideas that are based on fear. "I tell you, the Dark Cycle in Pisces has so colored and burdened the people (combined with anti-God-mastery, anti-World Teachers on that two o’clock line) as to make the children and youth of this nation bereft of a true understanding of life. Even their courses in literature and history are colored and turned and revised to reflect again the political thinking of the day. "Beloved ones, there is scarcely anything taught today that is not colored with a fear that therefore succumbs to simplistic ideas. You cannot reduce two and a half million years of karma and the betrayal of the fallen ones and the final age of Armageddon to simple ideas of peace and war, or freedom and anti-freedom. "Know this, beloved hearts: that the youth and children of every nation need Truth. They need logic. " "Take, for instance, my own desire to transmit to life, teachings most essential on the path of initiation through the Shakespearean plays. Why, with a population that scarcely knows the drama or the story of one play, how can I remind them by impressing upon the memory of the mind the tragedies, the comedies of life and the errors themselves that can be eliminated when one does not make too much of it—when one does not place too much self-importance upon the not-self? "Precious hearts, there was an era when the study of Shakespeare was far more widespread. Now it is left to those who go on to college and concentrate in English literature and in such disciplines. Thus there is lost to me a means of instruction. "It would be well even if the little children would learn the plays, from the standpoint of the stories, in language that they can understand. But, as always, going back to the original work, you will find not only keys to my own identity but, beloved hearts, the very keys and alchemy to the lowering into manifestation of my own Guru, the Great Divine Director’s causal body. And that causal body contains indeed the keys to the new order of the ages! "The New Atlantis rising is rising! And because it rises, there is a requirement of alchemy, of transmutation, as well as the tuning in to the original blueprint of golden-age civilization ordained for that continent, betrayed by black magicians and scientists who were the fallen ones, misusing the sacred alchemy and even some of the steps they had learned that came forth from the retreat of Zadkiel." "Each time the message of the Ancient of Days is translated through the several tongues of hierarchy, it transmits the unique energy and vibration of that tongue. And all of these collectively, cumulatively, do manifest the great power, wisdom, and love witnessed by the chelas of our messengers in the dictations of the Lords host delivered by the Holy Spirit through them . . .
"The confounding of the tongues at the building of Babel, by the judgment of Love delivered by the Archangel of the Third Ray, was the sign from God that He would not allow the pure language of the Word to be used in the defilement of that Word. Therefore the judgment manifested as the confounding of the original angelic tongues as the people could no longer communicate to one another their negative vibrations in the higher vibrating tongue of the Word. And the languages of earth and their uses by a karma-ridden and rebellious people departed farther and farther from the original sound of the Word. "Inasmuch as there are numerous laggard languages in use today as well as the tongues of fallen angels whose languages quite understandably are also fallen languages, it is the desire of the Great White Brotherhood to see English become the second language in all nations. For the new tongue of the dynamic decree spoken in unison by hearts of light the world around will surely precipitate a rolling momentum, reversing the tide of darkness and bringing in the long-awaited golden age of peace, freedom, enlightenment, and universal love. "Beloved ones, I perceive that you are beginning to understand that the pursuit of the gift of speaking with new tongues has many ramifications. May I tell you that most noteworthy of these is your speaking the universal language of Love. For this is the new tongue that I have brought to earth in my service as bodhisattva, as Buddha, as the beautiful Christ. "The language of Love is the language of the heart whereby you are empowered by the Holy Spirit of the lineage of the Ruby Ray to transfer the understanding of the treasured teachings of the ascended masters to all people, to all levels of awareness, to all states of consciousness. This making plain the truth is making straight his paths. And the strait gate to God is the souls ascent through the mediation of the individual Christ Self to the three-in-one of the Holy of Holies within his own Godhood." "' In the beginning was the Word . . . and that Word was God . . . and without that Word was not anything made that was made!' (Gospel of John 1:1) The Word referred to here is God’s most holy and sacred name 'I AM'—in general so carelessly and thoughtlessly used in conversation of all kinds by the populace of this dear earth, particularly the English speaking people. The Word 'I AM' as it appears in English today carries within it the full creative power of the Godhead and, as such, is used by all of us in our octave, as well as everywhere else in the universe. That Word (God’s name) can never have its vibratory action changed by translation into any other language for 'Je suis,' 'Ich bin' or any other combination of sounds which mean 'I AM' do not carry the same creative activity of God-power as does 'I AM' in English today. 'I AM'—for it will stand out as being the name used to specify Deity—even in those ancient times. Then is not the knowledge and use of the Word 'I AM' indispensable to your eternal victory of the ascension—since it is the open door back into the heart of your Creator? enable you to overcome every human appearance, instead of allowing that appearance to 'overcome' you, no matter how formidable that appearance or group of them may be. Today I bring to each of you who will accept it the substance of my victory—that golden flame which contains within it my living feeling of victorious accomplishment in all you do. This is a very real and tangible gift! Whenever you need victorious accom­plishment over anything, remember that I AM in the universe and that I AM no farther away from you than your own heartbeat. You see, the light which beats your very heart is God’s life and therefore a very real part of that victory which 'I AM.' Therefore, whenever confronted by any set of circumstances which portends less than God-success for you, may I suggest that you make the following call:"
" . . . just as 26 letters in the English language make up every book, no matter how profound or simple, so there are only a limited number of expressions and combinations thereof we can use to convey our message, until such a time as each individual’s own expansion of light opens up new avenues in them for the flow of greater cosmic rhythms! They little take into account the radiation of our love and the fashioning through repetition of their otherwise impoverished consciousness into a garden of loveliness such as is the mind and heart of every ascended being! "O dear ones, do not allow yourself to be trapped by the rhythms of monotony. There is so much of review that you need to anchor in your consciousnes—and often a different approach will touch a chord in your heart which has needed adjustment and tuning for centuries! Press into the Kingdom through reading our every word with eagerness. You can not over-indulge in Ascended Master material if you always call to the Presence of God, I AM in you, to anchor our radiation and protection in your four lower bodies and keep your attention on the Presence of God which is the only power that can then act in your world if you will accept it!" "The sacred Cosmos in the energy consciously enfolding man—this is the meaning of the word science. And so in the release of Fohat, the Sacred Fire from the letters, man finds the root meaning of every word in the lexicon of the Godhead. You are privileged, beloved ones, to have the inheritance of the English language wherein the expressions of the priests of the Sacred Fire upon Atlantis are realized through the sacred key I AM. "Behold, I AM Alpha and Omega, the beginning and the ending! And thus the beginning of the Golden Age comes forth as Alpha in the true religion of the ages whereby man is bound to God through the sacred laws! And the swirling fires of redemption that go forth from the very center of man’s being—rising and falling, ascending and descending—manifest the dominion of the Spirit, of the Consciousness of Alpha!" "Be it so, I, too, am subject to the Lords of Karma. And if they have decreed it, set aside your questioning and your resistance and get on with this mastery and take the Mothers gracious offeropportunity in the name of Portia to study and master the [English] language in such a very short time and therefore to be able to delve into the mysteries that are revealed in the Word. Our translations are for you the opening of the door. You must push it wide open and step through and get on then with perfecting yourself as examples of myself throughout Europe. "Blessed hearts, I speak out of profound love. And you must understand how Love does teach his children. Love, as the Mother flame within me, must come after you to let you know that in many areas of learning on this continent [of Europe] there have been highly disciplined ones who have become masters of science, of art, music, and every branch of human endeavor. They have stood out in the centuries, and always they are characterized as the ones who have been self-disciplined for a virtue, for a cause, for a talent, for a vision, for a goal." "Do not be set back by that which you meet. Let it be doused in violet flame. Go forth with the joy of precipitation. Take my 'little book' [On Alchemy], this precious book given to you by the devotees and staff and co-workers, by the Messengers therefore manifesting that concerted effort to see the physical manifestation of that which I have long desired to have in print. "I hold it in my hand in this dictation for a very purpose. For I am charging this copy and through it every copy of this book with the full, flaming presence of my new day, my revolution to all. May this book itself find its goal in every nation and in every language. "It is a handbook. It is the little book which may be devoured, and it will begin the alchemicalization. It will begin the process worldwide of the raising up of the coil of the violet flame. To this, then, be dedicated, and know that I have indeed come again, my mantle with me, our beloved Alpha and Omega and the Cosmic Council so decreeing that I may go forth in this hour and that I may truly have the opportunity of the quickening." "I, John, called of Jesus Christ, move with him daily. And we survey the scenes and the hearts of the people. If you would know what we have to tell you and what we together must bring about, call to us! call to us! call to us! "Let this organization and this worldwide Church apply the new ways of teaching. Let this Church come to a higher level—a higher level of genius, of performance, of understanding. Build, then, from the heart of God in the Great Central Sun, a City Foursquare founded upon the base of the pyramid, with the All-Seeing Eye of God in its capstone." "Do you see then that mankind’s science has been perverted through the perversion of the Mother? And since the Fall of Woman—the descent of her consciousness in to the lower levels of expression—science has not been true and the plumb line of Truth has not been the measurement of mankind’s science. "The sacred Cosmos in the energy consciously enfolding man—this is the meaning of the word science. And so in the release of Fohat, the Sacred Fire from the letters, man finds the root meaning of every word in the lexicon of the Godhead. You are privileged, beloved ones, to have the inheritance of the English language wherein the expressions of the priests of the Sacred Fire upon Atlantis are realized through the sacred key I AM." I suggest that you divide them up amongst yourselves so that when you take the staff as a whole and the larger Community as a whole there will be experts on certain years of Teachings, certain Masters and certain subjects, whereby the whole may be held in the heart one by one, some providing this portion, some another, and sharing it gladly with one another. "This Teaching must be a living and a vibrant teaching. It must be alive in your hearts and minds so that when you come together with your planning, beloved, you may also share the precious gems, many of which have not been found or looked into, many of which apply to the very current world scene." "Primarily, blessed ones, understanding the old saying, “Count to ten before you speak” (or release your thoughts or feelings out into the world) was first released as “Count to nine —in time” and was later changed by men who thought their own knowledge of English to be superior and did not understand the symbolic ritual which I release herewith, and which was lost to them. "The 'Count to nine—in time' imparts the power of the three-times-three, and is the ritual for encircling your being with Light’s protection. Immediately (in time) when wrong vibrations are sensed, start this action of the sacred fire. At the first, second and third count, encircle your abdomen with white fire to govern the feeling body; to the fourth, fifth and sixth count, encircle the throat with white fire to govern the physical form; and with the seventh, eighth and ninth count, encircle the head with white fire to govern the mental body. "As you do this three times for each of your three lower vehicles you will have absolute protection by the power of the three-times-three for your etheric body, which will remain secure in the immaculate concept while the riptides of life continue to blast around you. "The value of this ritual to you will be your freedom from the power men give to wrong conditions and that protection which the Great White Brotherhood desires all sincere students to have." "O souls of light, do you remember the hour when you watched as we stood to send forth the lightning of love into the Tower of Babel for the confounding of the language, the confounding of their tongues? And so confusion was wrought not by God, but by the people’s reaction to God, by the alchemical reaction. And therefore, there came the hour of the dividing of the Word of God when that single word which they knew as the angelic tongue became many words and many languages that now must swim by the great water of life and the River of Life to the center of the Logos and the understanding of the new Word of the I AM THAT I AM. "It can be understood in every language, yet the decree and the fiat of the Law must be spoken in the language it is given, in the English, which is the Anglish ‘the language of the Angleterre, the language of the continent of the angels,’ the coming forth from the continent of the air and the anchoring of that light for the dissemination through the twelve tribes of Israel throughout the continents and the nations of the earth that all the tribes who mourn together for the coming of the day of salvation might put aside their lamentations and find the birth of Messias within. "And is not the gift of the interpretation of tongues the gift of the interpretation of the new language of the teaching itself? Is it not the understanding of the alchemy of the Law? Do you not see that many times when you give the teaching in a language that is spoken by another, that that one has no conception of the teaching, no ability to understand? You might as well be speaking a foreign tongue, for there is no receptivity to the word. See, then, that truly it is the language of the heart that conveys the teaching. And some who do not understand English yet receive by the Spirit the teaching itself and listen to the dictations, and by the voice and by the radiation they are one with the new tongue of the Spirit. "The gift, then, of the speaking in tongues that may be given to you at any hour by the Holy Spirit and by the angels of Charity and Chamuel may come to you as the ability to give forth the flowing of the teaching and of the light as you are impelled by the Spirit within. So the gift of the speaking in tongues is the ability to deliver to the children of Israel in every nation that teaching of the I AM Presence, of the Law and the science of the Word he spoke, the very science of love that is the creativity of the cosmos." "As God does not neglect to say, 'Thank you, I appreciate your service,' so will you remember to say that word to one another—'Thank you!' And when someone says to you, 'Thank you!' will you remember the grace of the fulfillment of the spiral to say, 'You are welcome'? How often we hear that thank you without the return as carelessness or perhaps a feeling 'Well, I deserve that thank you' and therefore the response 'You are welcome' does not come. If you do not develop this habit of saying, 'You are welcome' to each other, you will neglect to say it unto God. When God says to you, 'Thank you!' be ready with 'You are welcome, Lord.' For in that word 'You are welcome,' there is the opening of your heart and the Lord does enter in. "And therefore, 'You are welcome' is a very important phrase. And it does not quite say the same thing in 'De nada,' for this is simply 'It is nothing.' It is not conveyed in 'Il n’y a pas de quoi.' But in English it is the welcome of the Christ, and when you say it to one another you are welcoming the Christ of your fellowman, of your neighbor, your friend, your family into your heart. And so the interchange of life and of the law comes about, and you see that the grace of diplomacy, the ritual of the seventh ray, is manifest in inner laws, in the extension of the comfort flame, and in the expression of manners and mannerisms which are conducive to the flow of light. Entering the Aquarian age then, it is time to learn that good manners, good decorum, and dressing properly is a part of the art of the sacred science of fohat." soul manifestation and there stakes its claim as the supreme reality of its beginning and its ending. "TAT (THAT) is the passageway of the Trinity which enters and conquers the Matter flame by the two T’s, crosses, where God in man is crucified for the redemption of all life. The A in the center is the Alpha son, the Buddha flanked by the two T’s, his bodhisattvas East and West. The English version that injects the H, sacred fire breath of Holy Ghost, present in the Alpha seed and son. Even when he gave up the Ghost with the parting prayer 'It is finished!' the two malefactors upon their two T’s heard as the sacred Word—MA I AM." "See that your children are fluent in Spanish and English and that they are schooled in communications, commerce and business. For the world is shrinking, and they must be able to interface with people of different backgrounds and cultures. mentor and will come with me to the Cave of Symbols, where I shall open to them the door of Aquarius. For I would give them a profound understanding of the role that each of them may elect to play in bringing in the golden age." "For you know, blessed ones, that semantics are a problem to mankind to the present day, and so the mere spelling of a word is not so important as the actual pronunciation thereof. And so as I speak to you to reveal—choosing to do this rather than conceal—I wish to implore you to see the meaning behind the word Gobi, for in this English-language word, as also concealed behind the power of the I AM, is the most wondrous concept of identity—'Go Be!' Go referring to man going forth from the heart of the Father and Be referring to man just simply being that which the Father is. "Do you see that as man stands on the sandy platform of this great reality, on the broad desert plain, he stands forth doing the Father’s will, simply being what the Father is? And in this holy concept of being, the subtle voices of the past with the discords of the past are stilled and man once again lives in holy innocence. 'Go be thou all that I AM!' is then a fiat for this age. In an age when the accent is not so much on being as seeming to be, it is essential that mankind be taught from early childhood not the fruits of hypocrisy but the fruits of purity; for it is purity which comes before the pure throne of God’s grace and draws from his grace the boundless radiance that makes a winner in the world as well as a winner in heaven. For victory comes to the soul of man, not through his desire to, as you say, 'lord it over' other men, but as 'the Lord rules over' him once again . . . "
"Thus, angels of God, ascending and descending, clear the way for your coming. And in anticipation of your coming you have been given by Moses, by the prophets the understanding of the names of God and their power, the names of God in the Hebrew tongue, beloved, as well as in English. "The names of God when chanted with deep devotion are an empowerment. Therefore, you shall know the great chalice prepared and prepared again by our Messenger, the messenger of music and the musicians to bring into the cells, atoms and electrons of your being even the levels of God according to the vibrations of the precious names of God. "Know the names of God and you will truly dwell in the Holy Spirit. Recite or chant the names of God in this order and you shall one day be admitted to the Holy of holies: Adonai, El Hai, Shaddai, Elohim Tzevaot, Adonai Tzevaot, Adonai, Elohim, El, Elohim, Yah, Ehyeh Asher Ehyeh, I AM THAT I AM. "Know, beloved, that for millennia fallen angels in all the world’s religions have denied the names of God unto the people, and yet the gift is unto 'the least of these thy brethren.' The name of God is not to be silenced but it is to be recited. It is to be sung. It is to be self-realized. 'And this is my name forever and my memorial to all generations, I AM THAT I AM' —Ehyeh Asher Ehyeh." the ‘Jews.’ The other ten tribes of Israel have reincarnated among the Gentile nations of Europe. The half-tribes of Ephraim and Manasseh, sons of Joseph, are peculiarly tied to the United States of America, Great Britain and the Commonwealth nation—i.e., the English-speaking peoples. However, neither term, Jew or Gentile, can be correctly applied to the seed of Light of Abraham, who descended from the Ancient of Days, Sanat Kumara. For those who are of the I AM Race, being endowed from on High by the Mighty I AM Presence with them, are correctly called ”Hebrew,” or Ibri in Hebrew, meaning “one who passes over” (from the crossing of the Euphrates by Abraham, c.1950 B.C.). Ibri is possibly derived from the Hebrew Eber, which means “the other side” or “across,” and may have also been used in reference to the descendents of the patriarch Eber. Abraham, who descended from Eber, is the first in the Old Testament to be called “Hebrew” (Gen. 14:13). Some scholars believe that the biblical word for Hebrew, Ibri, is equivalent to the Akkadian Habiru, or Hapiru, which is found in ancient texts (c.2050-c.1000 B.C.) throughout the Near East. The term Habiru denoted a social class of people who were “wanderers” or “outsiders” living a rootless existence. of Light of the twelve tribes, and some are not. Thus, by their fruits we may know the true heirs of the promises, whose Light has now been scattered amongst every tribe and nation and race and religion on earth. And the Light-essence of their consciousness in the Law of the One is the sign of their spiritual inheritance as sons and daughters of the Most High God. To those who pray, "I commit my life unto the cause of the Brotherhood," Cyclopea says, "Let that prayer . . . be a commitment that is action—right action." The Elohim therefore sent forth the call for "more books to penetrate the layers of darkness upon the earth," chastising those who "utterly fail to sharpen the tools of the mind in that self-expression . . . to know how to transfer that Word in speech and in writing . . .
"We have the passionate desire, the appetite that is the only lawful appetite, that is the appetite for victory, for freedom for every soul. And we know that in order to meet the cosmic timetable we must accelerate." And yet, "look not here or there, but look within—you upon whom the mantle of responsibility has been placed." "I AM extending a great energy in this hour, the energy of opportunity. It is a dispensation that the thrust for the purpose of truth must be forthcoming through each individual chela and that this dispensation of the Lords of Karma will not be released by the mere Word of God but only by the action of those who will make it so by the thrust of truthful, honorable action within their individual life." "Truly the speaking with new tongues is a gift of the Holy Spirit that is given by initiation to the souls who ardently pursue the living Word in the preaching of his gospel and who are daily believing and being baptized by meditation on and immersion in the living Father of the Lamb. The signs of the Spirit, of which this is the second, must be desired by you with all your heart, so much so that your temple is given over to the Holy Spirit to be his dwelling place forevermore.
" . . . And the sacred vows of the communicant before the altar of the Most High God are made to and through this same Holy Ghost. Those who would speak with new tongues must understand the elements of the pursuit of the Lord’s Spirit—the intense striving of the chela of the Guru that can be explained only by the soul on fire with the holy zeal of the Lord’s Spirit. the Word and they feel the flow of the sacred fire rushing through their temples. To them, Pentecost is not a day but a lifetime of experiencing moment by moment the infilling fire of that Holy Ghost. "They understand the supreme gift of speaking with new tongues as it is given for the crystallization of the Word of God from the Spirit to the Matter cosmos. Their celebration of the Word can be heard in their masterful giving of the mantra of the Mother. It is heard in the soundless sound of the secret chamber of the heart where the soul of the devotee communes —through the agency of the Holy Spirit—with the Lord Christ himself, who enters there and initiates the cycles of an expanding Threefold Flame.
" . . . The earning of the new tongue conveyed by the Master El Morya is by devotion to the diamond in the center of the whirlwind of the Lord’s Spirit. That diamond is the point of the universal mind of God that is lowered into manifestation in the beginning and in the ending of the Word. From the Alpha to the Omega of the Word, the disciples of God’s will chant the chant of love. Their offering upon the altar is the invocation to the fire infolding itself, the heart fire of their own Central Sun of Being." they are not shared and not spoken together—create that barrier whereby manipulation increases. "Therefore, blessed hearts and blessed Keepers of the Flame, mindful that my own once mother tongue of French is also spoken, I must say to you that this teaching must be delivered to all people, north and south and throughout this hemisphere. And I commend you —all of you who come from everywhere upon the planet—to realize that this hemisphere must be kept free, that the fallen ones must be cast down, that communism must go and that the tyrants sitting in the thrones of capitalism and their capitalistic governments must not be allowed to keep the people from freedom, from unity, from divine union with their Mighty I AM God Presence." "Therefore, beloved, the gift of the interpretation of tongues is one that you must seek. For the compendium of knowledge and of wisdom put forth by the messengers in their service is now in your hands, or ought to be, whereby you might not only teach and preach matters of Mother's Manifesto of Spirit and Matter, but also that you might interpret, explain, and, in some cases, condense and write the teaching for the assimilation of the multitudes.
" . . . Understand that you have matured and ripened and grown in your Christ consciousness through a momentum of teaching to which your souls have had access that was released beginning officially in 1958 in this activity. Though not all of you have studied all of the messages and teachings, simply because they have not all been made available, nevertheless, by being an active part of this community, you have assimilated the foundations of the Law because the foundations are always inherent in the ongoing structure. "Now, beloved hearts, I ask you to consider the world at large and the light-bearers and the children of the Light positioned upon this body of earth in this starry night when we would also make earth a star. These individuals who have never contacted this path or this teaching are, as it were, at the point of 1958. They have not had the teaching, the buildup of decrees, or the momentum. "And therefore it is the concern of the Darjeeling Council that the evolution of teaching, the unfoldment of it, be prepared for the world through the vehicle of our magazine, published paperback books and hardbound volumes, as well as cassette albums that may be distributed on a larger scale. "It is our consideration that the Keepers of the Flame, who have so lovingly and loyally kept their giving of tithes and dues for the support of the publishing, realize that you hold the balance and the flame. And it is the burden of light upon the messenger to publish these teachings, with the assistance of capable staff and students, not only for yourselves but for those who are waiting for the fundamentals and for the means to build their own pathway to the summit of Life. they must have a pathway of stones—each stone a step of initiation as well as a step of transmutation of their own worlds, their own chakras, their own past lives, so that they may be receptive to the master who stands on each step of the pathway that rises up Mount Shasta and up the Grand Teton and up Electric Peak and Mount Hood and the many mountains that grace earth's surface as pathways of initiation comparable and reflective of the paths and mountains of the etheric plane of the Himalayas where the blessed feet of the holy ones have walked." "And your Father-Mother God are impatient. For many souls will be lost if you do not make it your business to master the written and spoken word and to teach it as it was taught by the great Mercurians of old. "The mastery of the spoken word leads to the mastery of many fields of knowledge, beloved. But those who teach have not been taught. And thus, ignorance begets ignorance. in the reign of supreme wisdom in the crown chakra. "Know the peace of wisdom and the wisdom of being at peace always. Know the mastery of God within you. "The Seven Archangels who serve on the seven rays, the Five Dhyani Buddhas who serve on the five secret rays, and the Masters of the Far East come to this conference to empower those who are ready to be empowered. And we of the three kingdoms—the Elohim, Archangels, and Sons and Daughters of God—come today seeking to empower you on the Second Ray. Blessed ones, you must pursue this empowerment if you would have it! "Let the violet flame blaze through the crown chakra! Let it purge the body! Let the sacred fire of your mind contact all parts of the known and unknown universes and beyond into the Spirit cosmos. Open your mind to God’s Mind and see how the quickening of the crown chakra will come! "Where you have misused knowledge or wisdom in the past, using it to ends other than to the glory of God, you have a karma to pay. Pay the price of that karma if you would be empowered on the Second Ray. And when you give your violet flame decrees, call for the transmutation of all misuses of the Second Ray of God’s wisdom, illumination and understanding. "In each one who attains the power of illumination’s flame, that flame shall be as the beacon of a lighthouse flashing from the crown chakra and illumining people throughout the earth to the truth that there is a summit of being and there is a way to reach it. Yes, there is a way whereby the soul, through superior attainment, can rise to the level of the crown chakra. And when she does, she also makes contact with the God and Goddess Meru. "As the soul perfects herself, she is escorted by her Holy Christ Self from the seat-of-the-soul to the solar plexus to the heart and the throat chakras, thence to the third eye and the crown. But her place of beatitude is the secret chamber of the heart, where she communes with her Lord. The goal of the soul is to day by day become one with God, to day by day become more real, to day by day know herself as one with the allness of God and to know God as his allness in everyone. "We look at the state of education in every nation, and we say that even in those nations that have superior standards, education is found wanting. There will be no forward movement into a golden age of Aquarius if the twin paths of secular knowledge and spiritual knowledge are not braided together and if children are not taught in their mothers’ wombs and at their mothers’ breasts the meaning of universal life. They have come from the heavenly realms trailing clouds of glory. And so they are here. But what do they hear? They hear the rock music or the soap operas or just noise and more noise. "Blessed hearts, every child of light who descends to this planet, whom you bear in your arms, has been to the realms of glory. Even those with denser karma have been taken by angels to be given a peep at the heaven-world so that when they are born they might retain the memory of etheric cities and universities of the Spirit. For there their souls may attend 'night school,' augmenting courses they may take in the colleges and universities of the world. "You must infuse education with morality, fair play, an honor code and a spiritual path. You must set standards of excellence that parents, teachers and children can apply in all areas of their lives. For the state of education in America is so grave that if you do not turn it around, you will see that ere a century has passed, so much of the world’s culture will have been lost, along with the foundations of community, that should your soul reincarnate on earth, you would scarcely recognize the culture and civilization you once knew. "Therefore, without fail you must reverse the downward spiral of education! And you must replace it with all that will afford the world’s children the very best opportunity that heaven would bestow upon them." " It was given to them to carry the cup of the Christ consciousness and to bring the English language all over the world through colonization and through discovery, so that when the teachings of the I AM THAT I AM would be given again to the children of Israel, they would come through English language, the language chosen because it most nearly reflected the angelic tongue that is the source of the origiinal teaching to the original people of Israel. So it was the destiny, then, of the English-speaking peoples to carry that Christ consciousness to the new world." "We raise up our chelas. And when you willingly rise as we raise you up by the fervor of your freedom flame, you will see how that garment of the Lord, of the Ever-Present Guru, and the momentum of the early patriots descends upon you. And in that first hour of your first address before your peers or the public when you feel the mantle of our Brotherhood descend, you will know to what end you have pursued the path of chelaship to arrive at that moment when you feel yourself wrapped in that mantle of light or the power of Elijah. "Understand, blessed hearts, there must be the sharpening of the sword, a study of the Word, research in all levels of awareness in this octave. There must be practice. There must be penetration of the issues. There must be organization and thoughtful planning when you determine to speak. "As I told these representatives, though they knew not that it was I: You must do as well as the serpents—and outdo them! You must beat them at their game. If it is speech, communication, and going forth in government, you cannot refrain from coming under the rod of the law of expectancy to meet that level of expectancy within those norms and then by rapier thrust to transcend it and to deliver then more than that norm! And that more (being Thomas More as well) is the Holy Spirit! It is then that you will be heard in all the land. "Therefore simply because it is the fallen ones who have established standards in communication, do not scoff or rebel against it. Learn their ways. Be in the world, but not of it. "You will recall that I, as the Wonderman of Europe, wore the styles of the time. I was familiar with its literature and music but I exceeded their own levels of mastery—for, after all, I had some several hundred thousand years behind me. "Beloved hearts, I could perform anything and all things as they could—but better. This is what I ask of you: not to bypass the standards and expec­tancies of your era but to recognize that you must speak the language of the people but speak it better—better, louder, clearer! "You know that I would wear precious jewels in the buckles of my shoes and belt. Thus upon closer examination of my garments, I dressed as they dressed but there was something more, therefore something in store for them—something I had that they wanted. Of course, it was the light. And they were not willing to pay the price but rather to use it as an adornment for their personal egos. And by and by, fulfilling the law of karma, I was compelled to move to other courts—to America, to the Royal Teton, to establish here what was not possible to establish in Europe." " . . . I have stood in the atmosphere of earth, high over the city of Babylon. I was present when the great love ray of God descended over the Tower of Babel to cause confusion of speech to enter into the hearts of those who were there present, to divide them and separate them from one another because of the manifestation of wickedness. "I beheld how the great love/wisdom of God scattered men, that they should not continue to learn wickedness from one another but that rather in their scattering they should find more opportunity to commune in the quiet places of the world, finding solace in the inner radiance of their being. "Beloved ones, countless dawns have I beheld. But the dawn over the Tower of Babel, the day of the confusion of speech, was a memorable one in the chronicles of earth. It was a memorable one even to the heart of an archangel. "Many are the mysteries which mankind have faced. And some of the mysteries seem almost ponderous to the heart of an archangel. 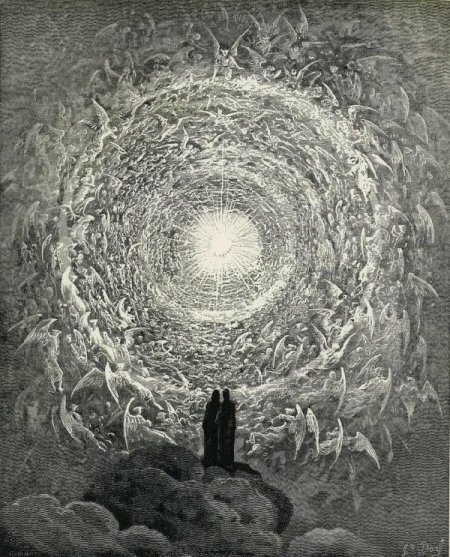 "Why did men, created and endowed with all of the glorious opportunity which was given to those of us known as arch­angels—why did men turn from the Great Light which gave them birth, their great God Source? Why did they turn toward the outer, toward matter, toward human creation, toward the outer consciousness? "Why did they feel the need to compete with one another? Why did they feel the need to learn arts of deception and practice them upon one another when the simplicity of the mighty Spirit of Truth within them would have endowed them with the power to perceive in one another's aura the very truth of their being? "And no deceptions could have been practiced whatsoever if the mankind of earth would have held their glorious contact with their Mighty I AM Presence. But they wandered away and became children of clay rather than children of the sun. And as they turned toward the clay and began to fashion houses of clay, working in the world as in a pile of rubble and esteeming it as such (when it is composed of pure light substance), then man­kind, by reason of spiritual wickedness in high places, descended from their high estate. "And I shall not rehearse the wickedness which mankind externalized. It is not pleasant for me to contemplate; and certainly you have been surfeited in it, O mankind of earth, and desire not to dwell upon it or in its vibratory action. And therefore, I merely touch upon it because by contrast I would point out the immortal birthright which mankind ought to cherish. "Popularity, beloved ones—popularity is a great myth. The mankind of earth have been overcome by the juggernaut, the juggernaut of human opinion. Mankind down through the cen­turies have gazed upon one another to perceive if man approved of God. "Well, beloved ones, God is good. The words may be simple, but the idea is profound because it is eternal. And the God that made the earth, the sea, the land, all that is, in gazing upon his creation spoke those blessed words: 'Behold, that which I have made is good.' And in a similitude, the creation, the reflected creation, manifested the pure light of that radiance which gave it birth. The world glowed with the transcendence of atomic energy. The bodies of men glowed. "No cosmetic was required to adorn those cheeks made rosy with the power of divine love. No cosmetic achievement was required for those ruby lips that breathed a prayer of praise to the great high priest, the Holy Christ Self of their being. No cosmetic adornment was required for the beautiful clearness of their eyes, splendid with the light of God. No cosmetic adornment was required for the crown of the angelic radiance known as their hair, beloved ones, that was as mighty light rays, each one charged with pure gold, the color of the sun shining in his strength. "Beloved ones, that day is ever here! It belongs to the eternal day of oneness. It is only in the separate consciousness of mankind passing through the spheres of human density (in the form of time changes, density changes, transportation and phases of consciousness) that that day is obscured. For all of this causes mankind to see the love of God veiled through a human veil, qualified by man with his opinions, his ideas, and his concepts. If those concepts be pure, then the beautiful externalizations reflect more of the divine radiance. If those externalizations are aborted or are opaqued by human densities, they do not reflect the radiance of the Eternal One! "And I am come today to teach you the power of adoration's flame. Those of you who are charged specifically with the wisdom of the Keepers of the Flame know the beauty and power in declaring, O God, you are so magnificent! Will you declare it now, with the voice of an archangel, with me? Will you repeat nine times, O God, you are so magnificent! "O God, you are so magnificent! O God, you are so magnificent! O God, you are so magnificent! O God, you are so magnificent! O God, you are so magnificent! O God, you are so magnificent! O God, you are so magnificent! O God, you are so magnificent! O God, you are so magnificent! "Within your hearts is a pearl of great price. In rainbow, iridescent splendor that pearl reflects the beauty and holiness of God. Men dwelling in a lesser state of consciousness, men afflicted with human lethargy and the disease of delay, procrastination, doubt and fear, do not perceive the great pearl that is within you. You have been admonished that you ought not to cast it before them but to retain it as did beloved Mother Mary, who is of our kingdom, within your own chaliced heart. "But the day is coming and swiftly when the knowledge of God, the true knowledge of God, shall cover the earth around about as a mighty sea, when the flood tide of his love shall inundate the human concepts. And men shall abide within their own ark of salvation, dwelling in the holy place to which Moses carried the ark of the covenant, dwelling in the place where the Shekinah glory of the Most High God ought to shine forth the radiance from the portals of the heart. For within the heart of God is the adoration flame of pure divine love. "What is the 'A-doration' flame? The first letter of your alphabet begins with A. The first declaration, God! is Alpha, the beginning. Beloved ones, adoration to God is a service of all men. And when the great streams and rivers of divine purity flowing forth from the crystal throne enter into every waiting heart, the answer shall be given to men to all that they seek. "Do you think, O children of mankind, that your silent musings are unheard? Do you think that your prayers uttered sometimes in despair and hopelessness are not understood? Those of the angelic host who comforted the Christ in Gethsemane have assuaged much human grief, have brought oceans of comfort to mankind from the invisible octaves—unknown by mankind, unrealized as the service of an angel. "Men say they do not believe in angels. Well, I am here! I am here this morning to give within your hearts the tangible witness of our reality—the reality that leaps for joy at the mighty name of God, I AM! "You will hear the bells now tolling from your steeples here. You will recognize that there is an eternal Angelus which descends upon the hearts of men. You will recognize that there is a day of eternal prayer in the temple of lives of nobility. You will recognize that the love of God, flooding forth and charging forth into the newborn infant, flooded forth with hope—the hope of the hearts of heaven. "Beloved ones, your hearts are touched by a twinge of nostalgia as you contemplate your own mother's love for you. What then of the love of the Cosmic Mother? What of the hopes of God for men? What of his hope? What of it? "Beloved ones, pause to consider and recognize that you ought to receive from his heart not only a touch, but the fullness of his immortal purpose. It is your responsibility to externalize it. The entire hosts of heaven, the angelic hosts, the cosmic masters, the entire Spirit of the Great White Brotherhood stand ready, willing, and able, waiting to assist you in outpicturing the great grandeur and nobility of your own being! "Come, then, and reason together, saith the Lord! Enter into the great temple of your own being, a temple builded eternal in the heavens—the Christ consciousness of your own Higher Mental Body. Your Holy Christ Self is the chief cornerstone thereof. It does not build in deceit. It does not build in confusion or hypocrisy. It does not build in disunity. It builds in the eternal unity of God, E pluribus unum—'one out of many,' out of many, one. "From the Spirit of Oneness came forth diversification, but all returns in heart and essence to the One, because in that essence is the iridescence of God, the splendor of joy to the world, peace upon earth, on all worlds good will toward men. "The Spirit of God, as a girdle, as a garment of love, sweeps the world around. The roses from the heart of the Maha Chohan burst beneath the feet of men and they speak to them of those days of childhood innocence when men were not aware of so-called sin, of the effects of karma or the need for mitigation, when mercy was not thought of, for men only expressed the perfectness of God. "In that City of God, that City Foursquare, the perfection of God eternal rests yet in the temple of immortal being. It awaits each lifestream's own decision, own desire, each lifestream's own acceptance and the pressure of acceptance of that immortal opportunity. The fraternal love of God must express beneath the Fatherhood of God, beneath the brotherhood of man. But it must express in exaltation." " . . . The alarm that is sounding across the retreats of the Great White Brotherhood in this day and in this hour concerns the education of people at all levels. People are losing the ability to speak their own languages, to formulate their own ideas, to enter into the logic of a Pythagoras, to come to an understanding of the basic concepts of the science of life or of music or of so many disciplines that allow the expansion of the chakras." " . . . And the voice out of the bush declared Self-awareness--being that proceeded from the fiery core and declared our God-identity: I AM WHO I AM. In the Egyptian, NUK PA NUK…. (chelas are taught) to go within to the fiery core, to dip into the fountain of light with the sacred aum, to tarry there as Jesus did when he withdrew from the multitudes and went to a place set apart.
" . . . So the law that is written in the inward parts of man is the name of God written in the heart. In living fire a-u-m is written in your heart. It is written in Sanskrit; it is written in English; it is written in the tongues of angels. It is a kernel of light that speaks in every language." Victor Borge's two most famous verbal routines were Inflationary Language and Phonetic Punctuation. A military doctor following World War II used phonetic Punctuation as a diagnostic tool. Many soldiers experienced hearing loss, and doctors had trouble determining the cause. A doctor discovered that if they played a recording of Victor's routine, the patient would start smiling if the cause was psychosomatic, which could be cured. If the patient didn't smile, they knew the cause was physical, and the hearing loss was probably permanent. According to Victor, "he (the doctor) said many of the patients were helped that way. That made me very happy. I don't think anybody could remain stoical in the face of laughter." "The smile is the shortest distance between two people," he observed. Most astonishingly, he became a genius in his second language—English, which he learned by spending day after day in movie theaters. Many years ago, Victor Borge created the game of inflationary language. Since prices keep going up, he reasoned, why shouldn't language go up too? In English, there are words that contain the sounds of numbers, such as "wonder" (one), "before" (four) and "decorate" (eight). If we inflate each sound by one number, we come up with a string of puns—"twoder," "befive" and "decornine." Here is a story based on Borge's idea. This tale invites you to read and hear inflationary language in all its inflated wonder—oops, make that "twoder" and to remember the linguistically pyrotechnic genius of The Clown Prince of Denmark. After making sure that Jack nine a sandwich and drank some Eight-Up, his mother elevenderly said, "Threedeloo, threedeloo. Try three be back by next Threesday." Then she cheered, "Three, five, seven, nine. Who do we apprecinine? Jack, Jack, yay!" Jack set fifth and soon met a man wearing a four-piece suit and a threepee. Fifthrightly Jack asked the man, "I'm a Califivenian. Are you two three?" "Cerelevenly," replied the man, offiving the high six. "Anytwo five elevennis?" "Not threeday," answered Jack inelevently. "But can you help me three locnine my fivetune?" "Sure," said the man. "Let me sell you these twoderful beans." Jack's inthreeition told him that the man was a three-faced triple-crosser. Elevensely Jack shouted, "I'm not behind the nine ball. I'm a college gradunine, and I know what rights our fivefathers crenined in the Constithreetion. Now let's get down three baseven about these beans." The man tripled over with laughter. "Now hold on a third," he responded. "There's no need three make such a three-do about these beans. If you twot, I'll give them three you." Well, there's no need three elabornine on the rest of the tale. Jack oned in on the giant and two the battle for the golden eggs. His mother and he lived happily fivever after—and so on, and so on, and so fifth. a BBC site with sections on grammar, vocabulary etc. and how to use the internet. (lots of tasks, exercises, quizes, vocabulary etc. "The Essentials of Language Teaching"
giving quick definitions for when you get stumped. of new words and phrases. These are not "stunt words"
whatever you know them as, this site is about them. and have them picked up by someone else at a later time. "What they did not say"
Simple & SECURE web document sharing. Once, in an Italian restaurant, we ordered 'spaghetti carabinieri' instead of "spaghetti carbonara." We had asked for spaghetti with policemen on it. In England, we were once asked at a hotel by a pretty woman at the front desk: "Would you like to be knocked up in the morning?" "Well," we replied, "we don't know if it will work, but we'd be happy to try." 1. I'm God. Don't play me. and charms outta me, or like me. 5. Don't dis or cuss out yo momma..
is, don't dis him neither. 6. Don't be goin' on no drive bys. 7. Stick to ya own Boo. man to save your behind. homie's crib, ride, woman, or nuffin.